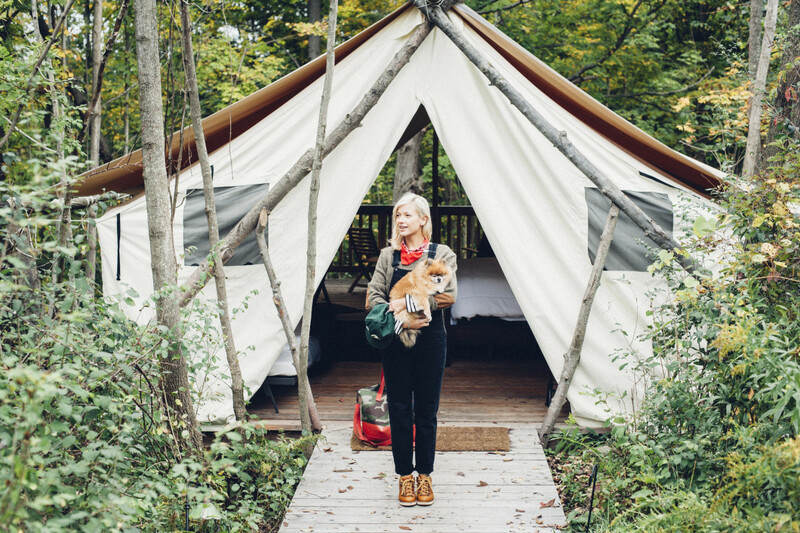 Glamp by the “Firelight” with some of your besties at this spectacular campsite in Ithaca, New York! 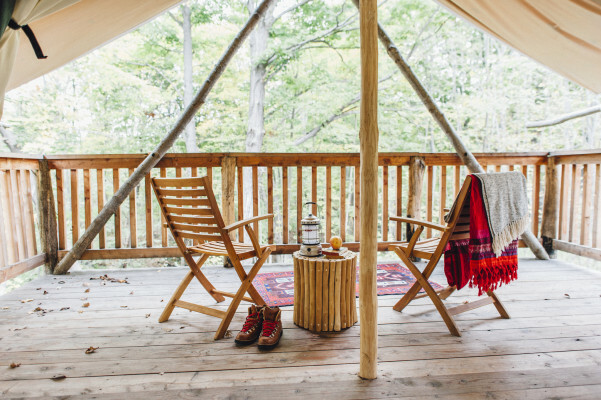 Comfortable, stylish, and peaceful are just some of the ingredients that make this trendy campsite so perfect for a weekend escape with some of your best friends. 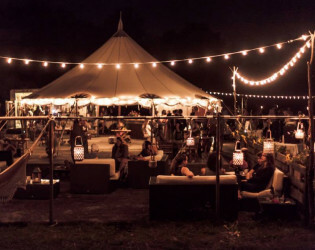 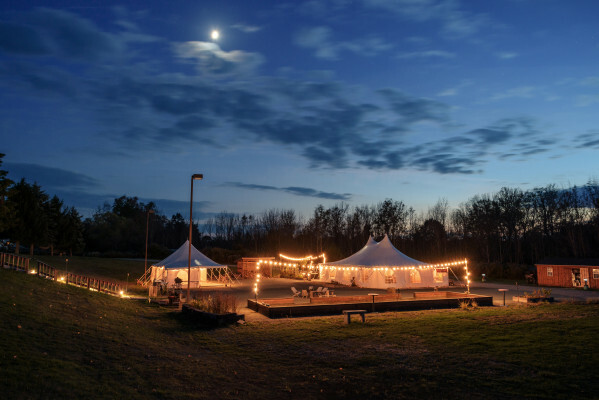 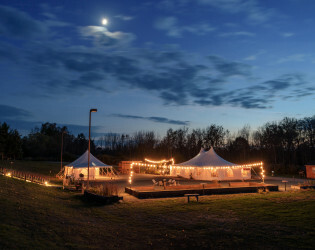 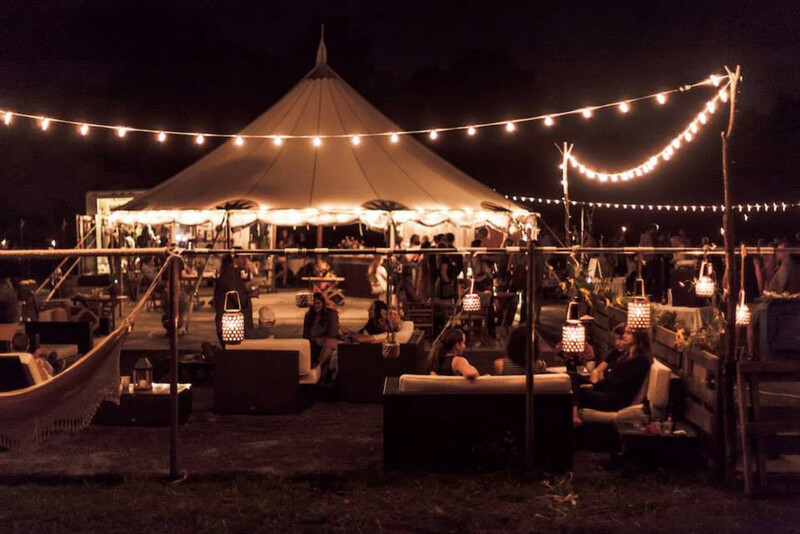 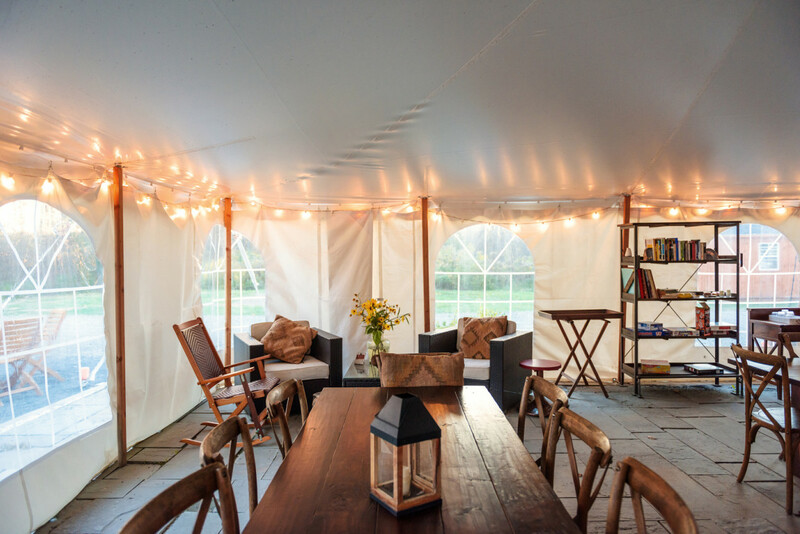 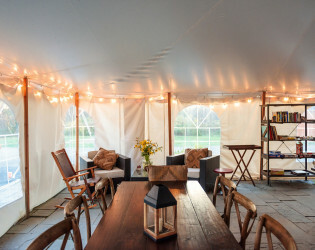 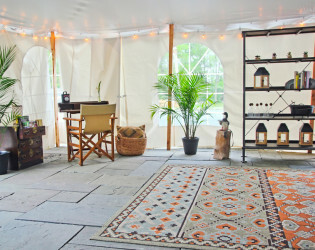 From the amazing tents with scenic views that come complete with high thread count linens, lanterns, and cozy furniture to the complimentary breakfast meals catering to all dietary needs, you and your pals will never want to leave! 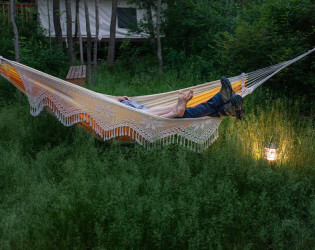 The wind rustling through the trees. 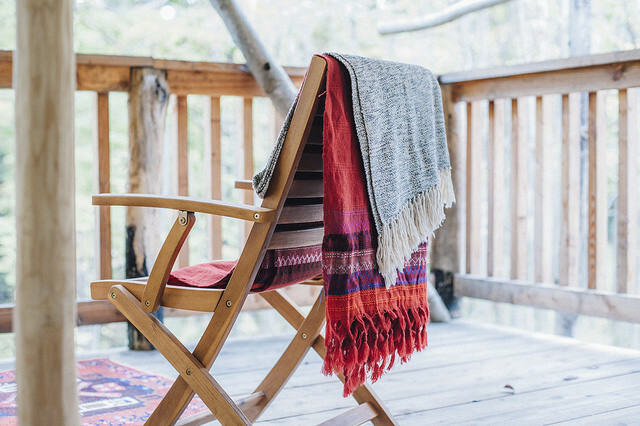 Brisk morning air. 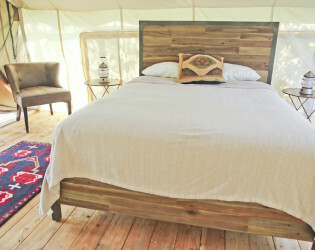 All from the comfort of your bed... No setup required. 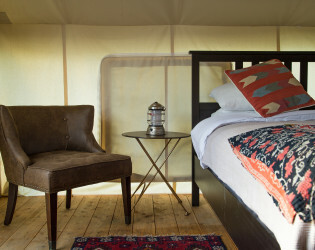 Made up with high thread count linens, your tent is off-the-grid and warmly lit with battery-powered lanterns (that can also charge your phone). 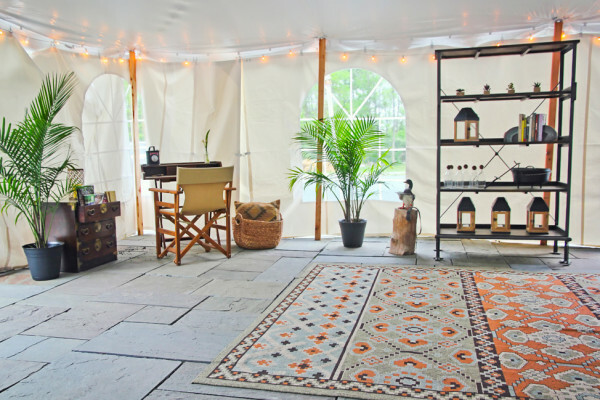 Mesh screening helps keep the critters out, and comfortable furniture - such as the writing desk - gives you a place to muse on your ideas or simply relax. Find a hammock a few feet away to escape with the birdsong. 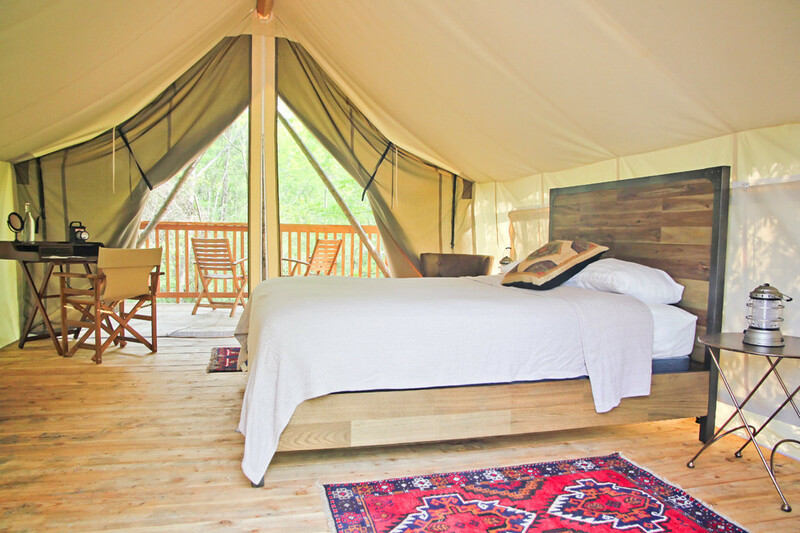 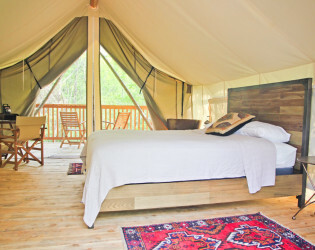 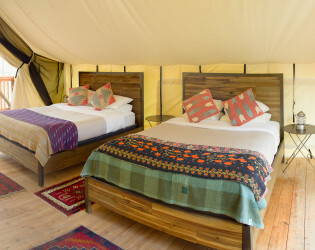 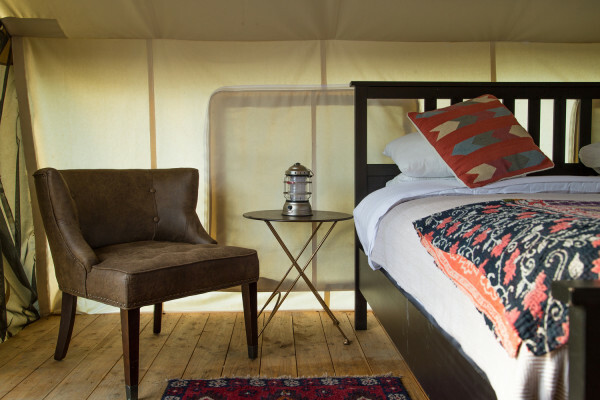 Catering to be contracted separetly, we feature 18-20 luxury overnight accommodation tents. 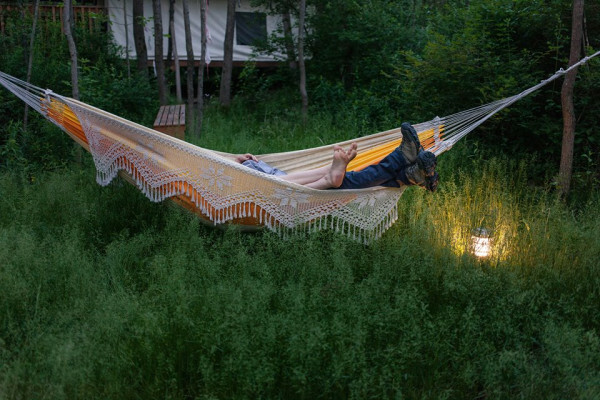 Minimum tent block required. 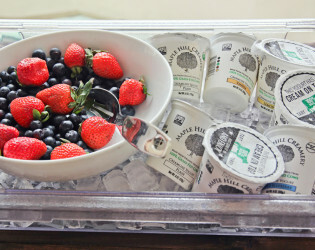 Ask about booking a wild edibles hike through buttermilk falls state park! We're a campground that operates like a high quality hotel ... with the perks of being outside. 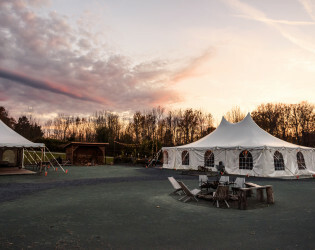 Our furnished lobby tent includes front desk reception, where you can check-in, find trail maps and learn about a range of local and regional activities from our Camp Host. 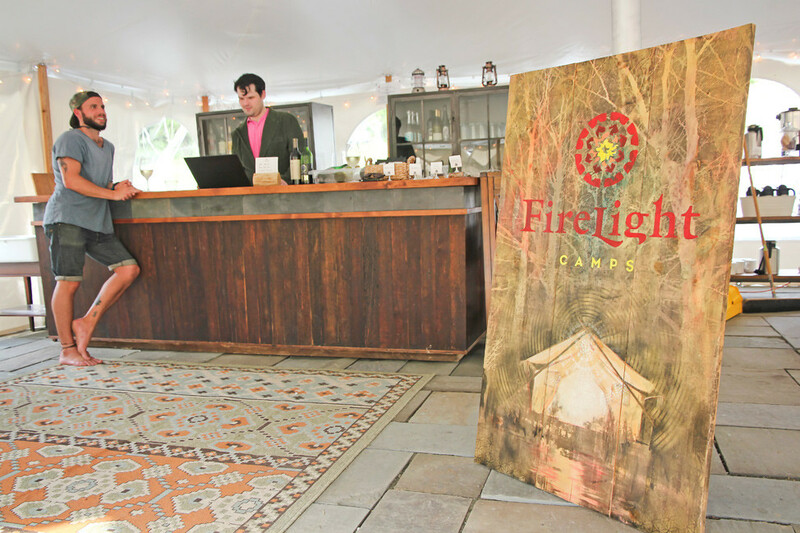 Our bar serves an array of Finger Lakes craft beverages, and we offer freshly brewed Firelight Coffee, hot water and tea at our beverage station. You can refill your canteen at our water dispenser and plug into the phone charging station. 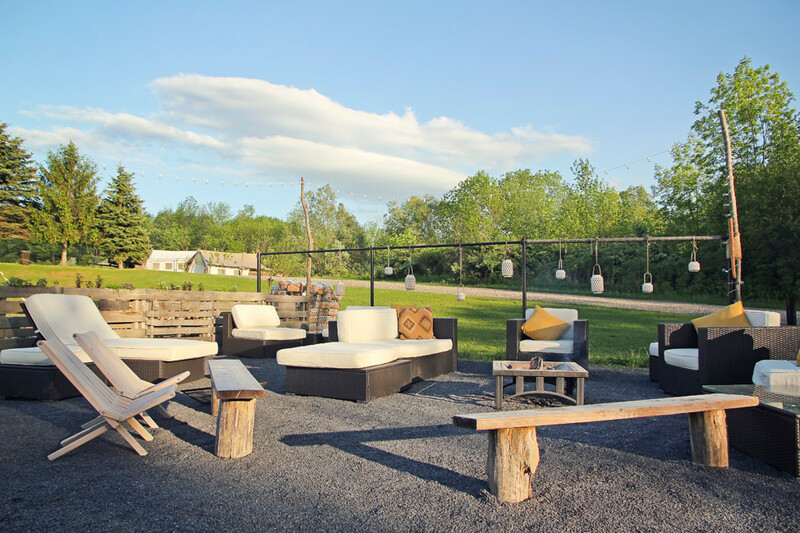 Our complimentary, locally sourced continental breakfast is served daily from 7:30 - 10 AM, and at sundown we light the communal campfires in the outdoor lounge areas, where you can play an assortment of games including bocce ball. 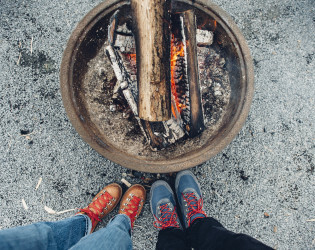 Our camp store includes Firelight Camps homemade s'more kits and trail snacks, Firelight Camps apparel and other outdoor inspired knick knacks and necessities. 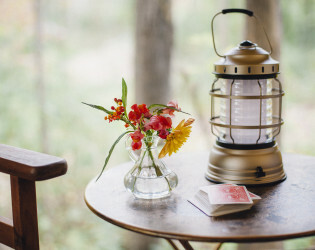 Firelight's backyard of Upper Buttermilk Falls State Park. 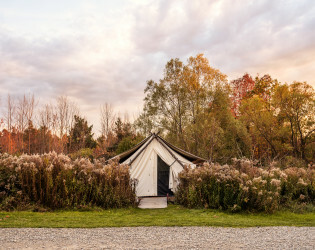 The trailhead is located outside your tent flap, and will take you on a winding journey through one of the Finger Lakes' iconic gorges and cascading waterfalls. 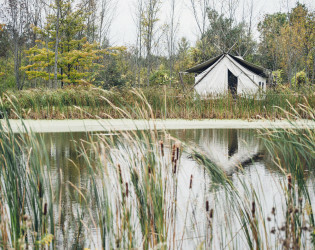 Delve deeper into the forest with a Wild Foraging Hike - a hands-on adventure with local experts where you'll learn to identify and harvest a variety of wild Northeastern plants, while maintaining the diverse forest ecology. 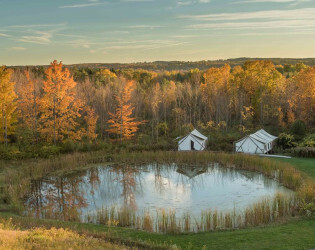 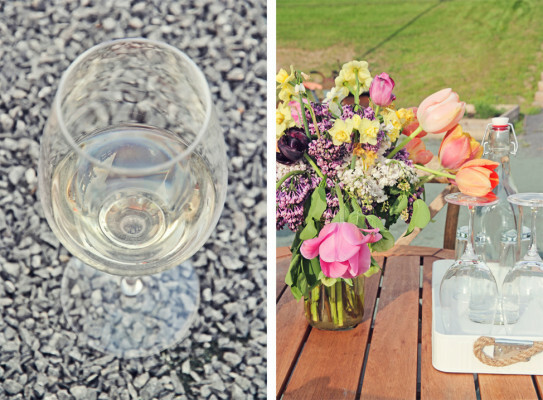 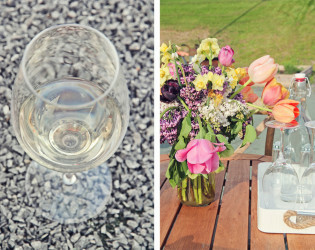 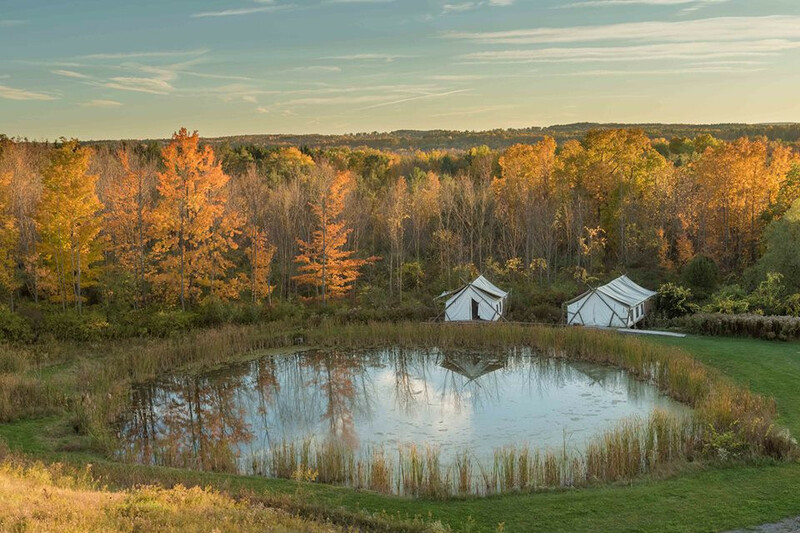 The Finger Lakes is a treasure trove of places to explore beyond our glampground, including wineries, cideries, farms, restaurants, waterfalls, trails, lakes, art, music and theater. 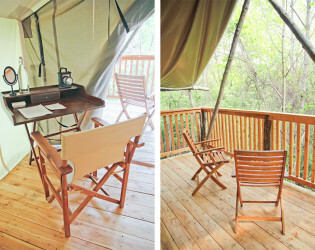 Our Lobby, Safari Tents and Communal Bath House are all brand new. 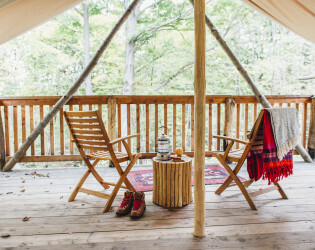 CAMP STORE PROVISIONS: Our camp store offers locally-made trail snacks and souvenirs, including our Firelight Camps homemade s'more kits to complete your quintessential American campfire experience. COFFEE: Firelight Camps coffee brew kicks up the meaning of "campfire coffee." 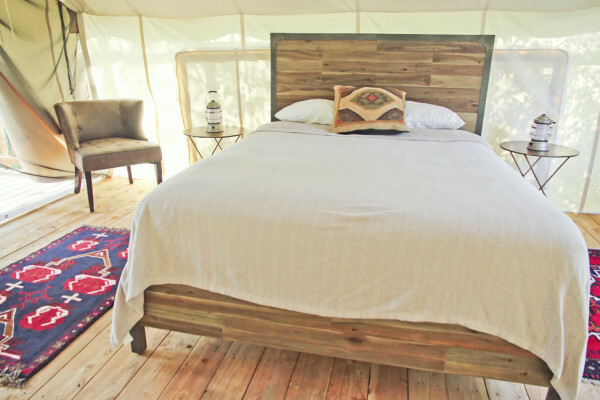 Our founders, Emma & Bobby, opened their first hotel in Matagalpa, Nicaragua in the heart of coffee country. 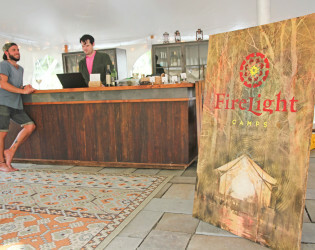 When they opened Firelight Camps in Ithaca, they weren't willing to trade in the world's best coffee. 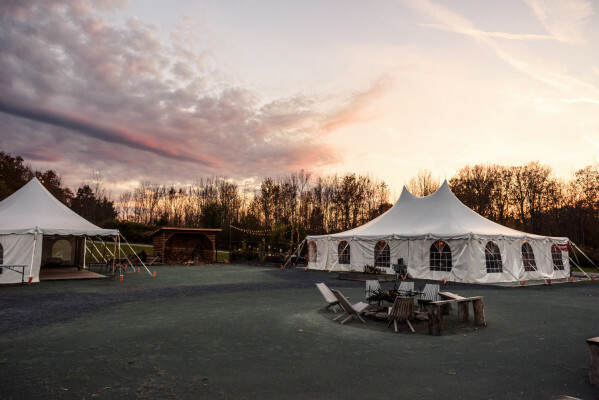 So, they connected with their friend and Nicaraguan coffee farmer, Enrique Ferrufino, who manages Proyecto Aurora, a group of coffee farmers dedicated to reinvesting a percentage of their profits in sustainable growing practices. Enrique's beans now arrive fresh at Copper Horse Coffee in Ithaca, where owner Jesse Harriot roasts a specialty Firelight Camps blend. 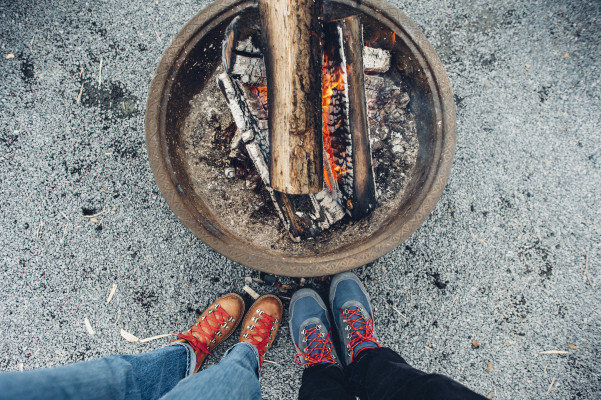 Jesse also made sure we were brewing the best possible coffee for our guests, using a pour over method you'll be hard pressed to find in any other hotel lobby ... let alone around the campfire! 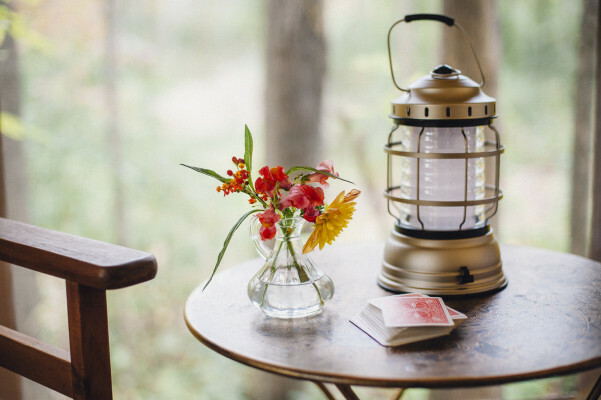 BYO PICNIC: We encourage you to bring your own picnic to Firelight Camps, or collect cheese, preserves and other culinary treasures when you explore the region to sample back at camp. 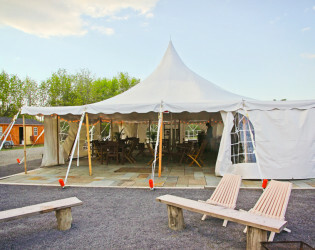 Use of our large outdoor Lobby and Event Tents, onsite bathrooms, use of water, electric & internet. 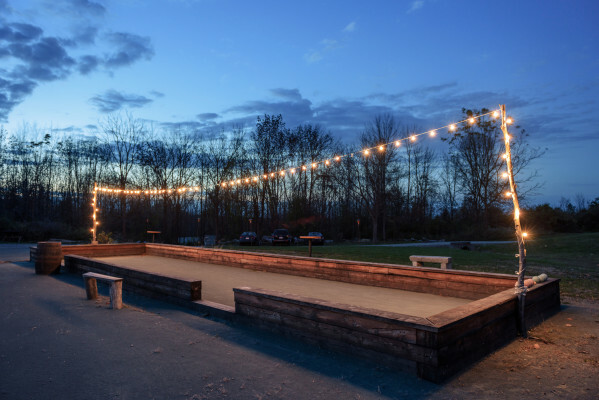 Access to our current inventory of tables, chairs, benches, bocce court and fire pits. 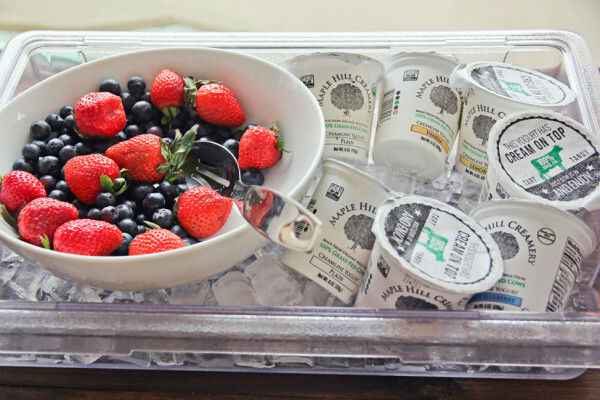 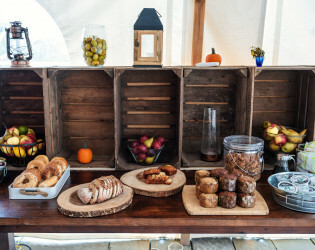 BREAKFAST: We serve a complimentary continental breakfast in the lobby from 7:30 - 10 AM , featuring artisanal breads, butter and preserves, pastries, fresh fruit, yogurt, house granola, seasonal juices, tea, coffee and milk. Gluten-free and vegan options are available. LUNCH & DINNER: Our Camp Hosts can help you choose from an extensive array of local eateries in downtown Ithaca and wine country. On the property, you can also dine at The Bistro at La Tourelle for lunch and John Thomas Steakhouse for dinner. 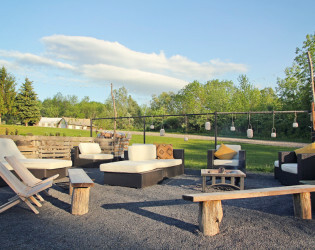 BAR: Happy Hour begins at 5 PM when we spark the evening campfire; the bar remains open for service until 10 PM. 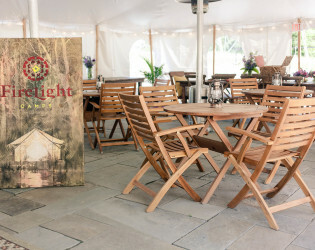 We offer a selection of Finger Lakes wines, beers, cider, spirits, specialty cocktails and non-alcoholic artisanal sodas and juices. 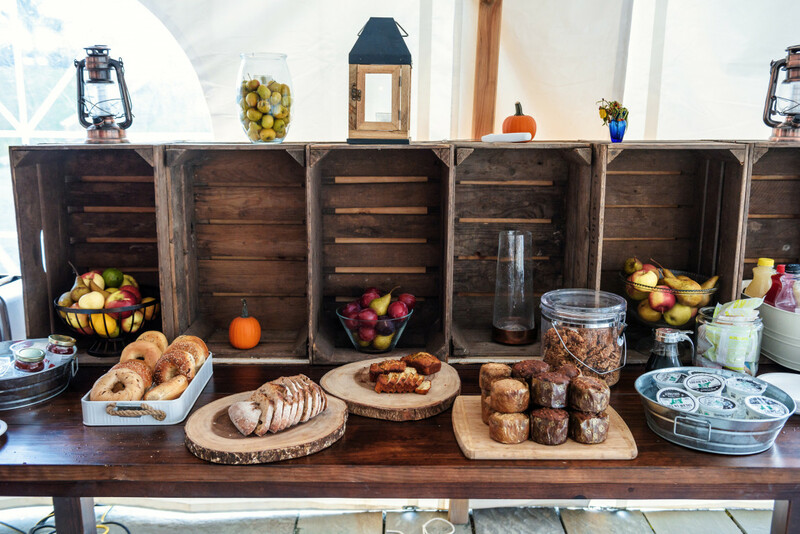 We provide a complimentary tasting for each guest during each night of their stay, and include seasonal offerings like our autumnal hot chocolate bar or mulled cider. 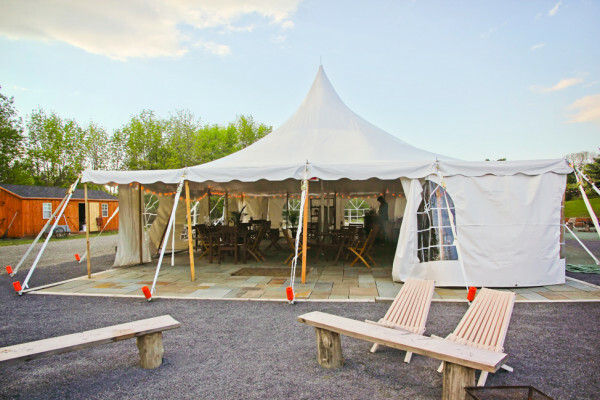 **Guests may consume their own alcohol in their tents, but are not permitted to consume their own alcohol in the lobby or communal areas. 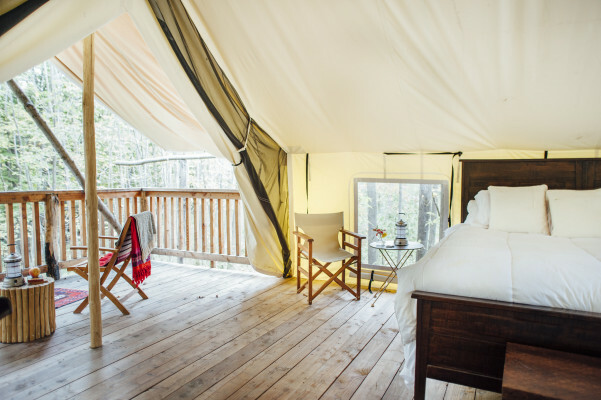 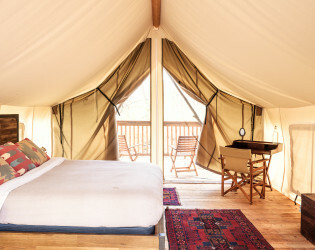 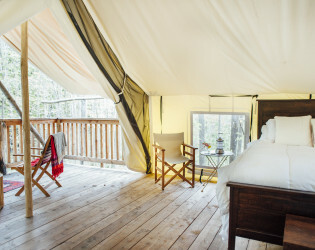 Firelight Camps' mission is to create comfortable, stylish camping experiences that awaken our staff and guests’ appreciation for nature, inspire adventure and deepen connection with family, friends and community. 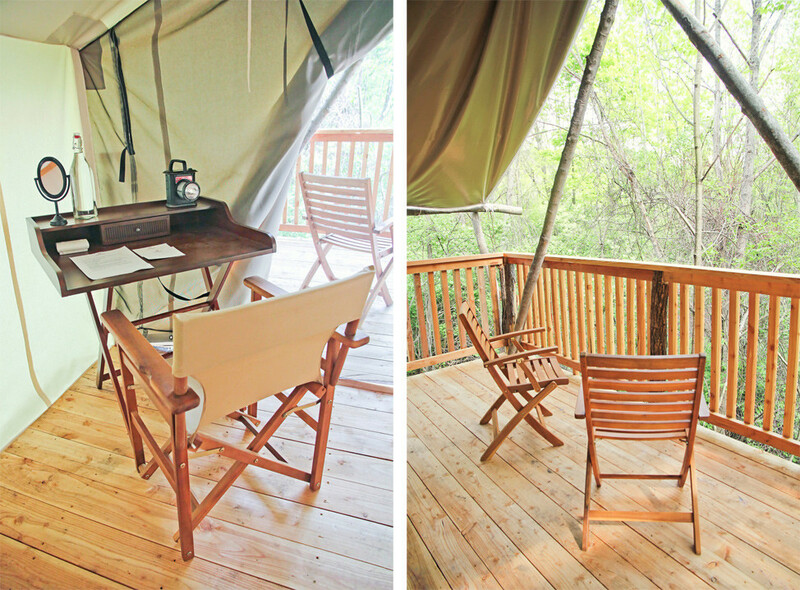 We're a campground that operates like a high quality hotel ... with the perks of being outside. We encourage you to bring your own picnic to Firelight Camps, or collect cheese, preserves and other culinary treasures when you explore the region to sample back at camp. 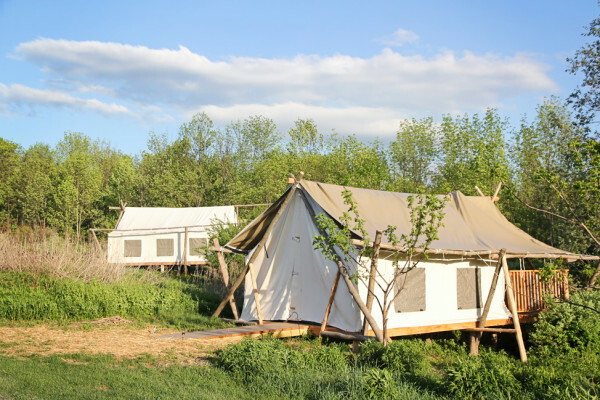 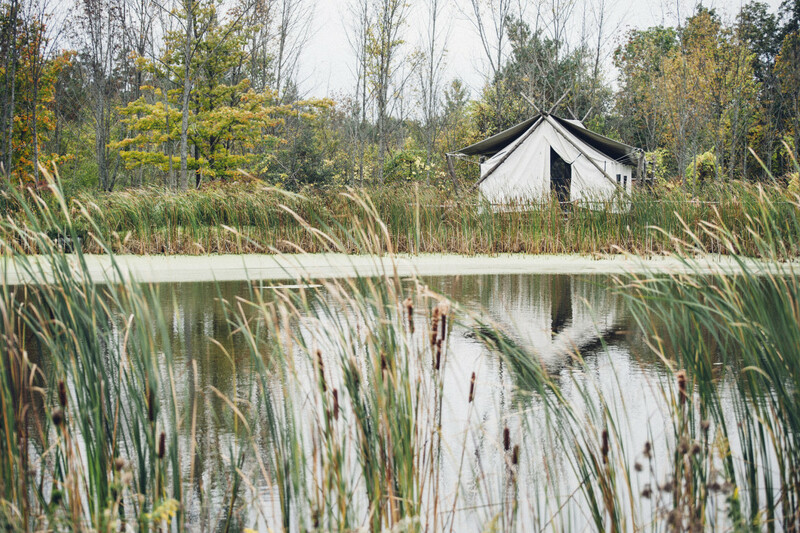 Our camps pioneer low-impact infrastructure and natural landscaping that help sustain rural and wild properties while providing guests with opportunities to explore and experience the natural beauty. 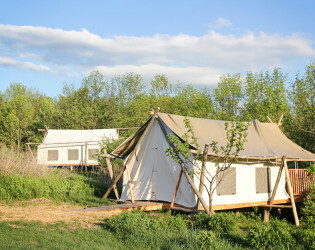 The wind rustling through the trees. 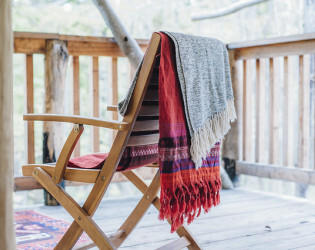 Brisk morning air. 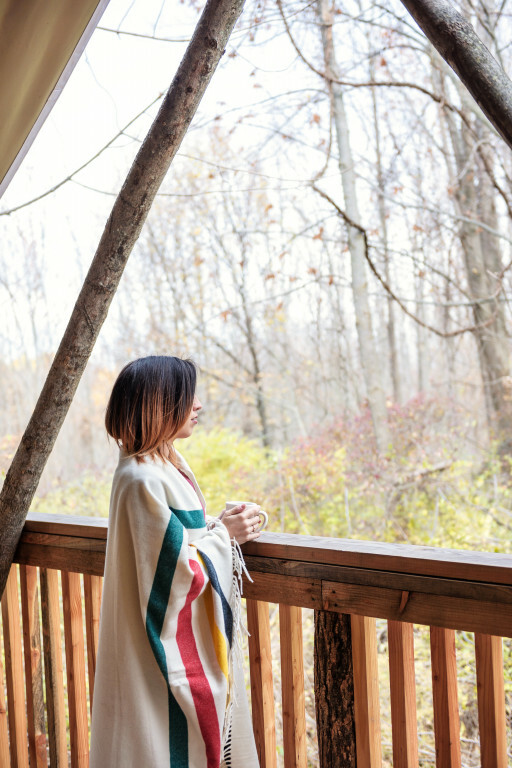 All from the comfort of your bed ... No setup required. 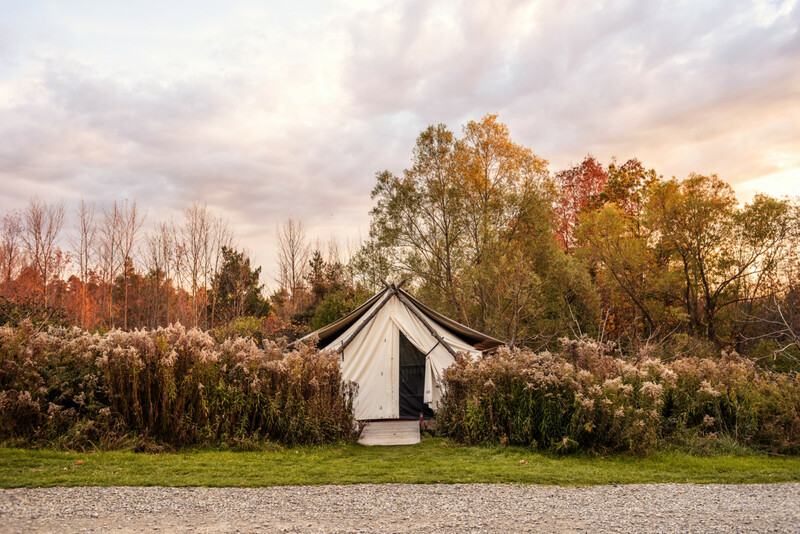 Our furnished lobby tent includes front desk reception, where you can check-in, find trail maps and learn about a range of local and regional activities from our Camp Host. 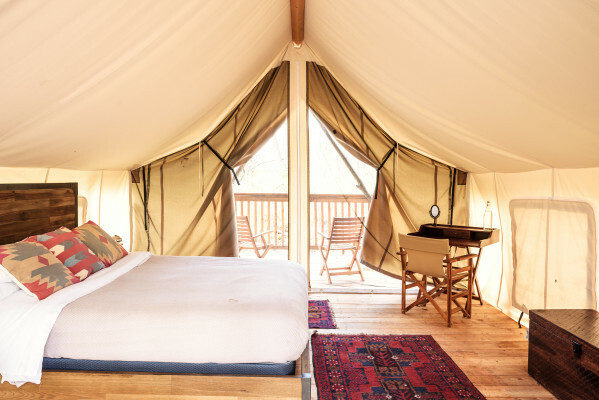 Made up with high thread count linens, your tent is off-the-grid and warmly lit with battery-powered lanterns (that can also charge your phone). We invite our guests to relax into the natural beauty of our camps in a way that feels easy, comfortable and clean, while inspiring a sense of adventure and novelty for first-time campers. 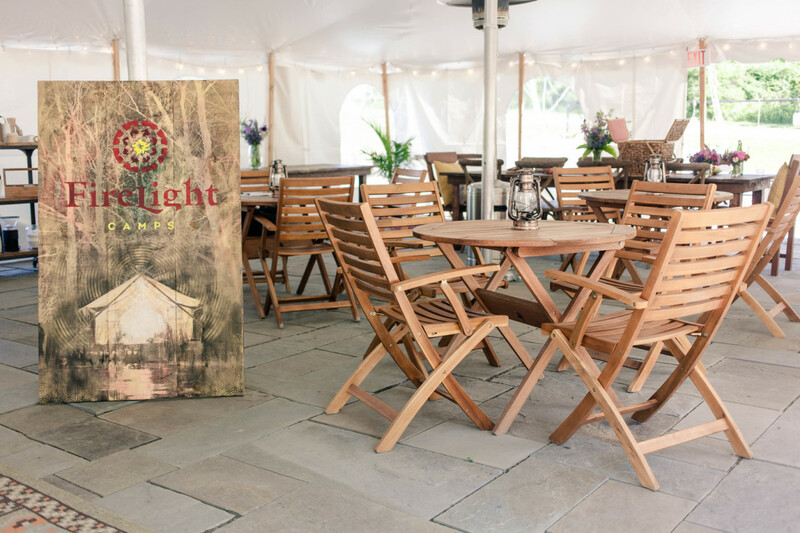 Our bar serves an array of Finger Lakes craft beverages, and we offer freshly brewed Firelight Coffee, hot water and tea at our beverage station. 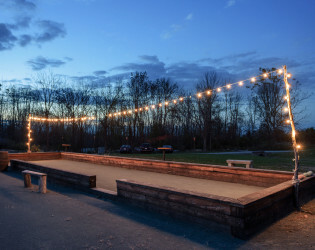 Bocce ball court, and other onsite games. 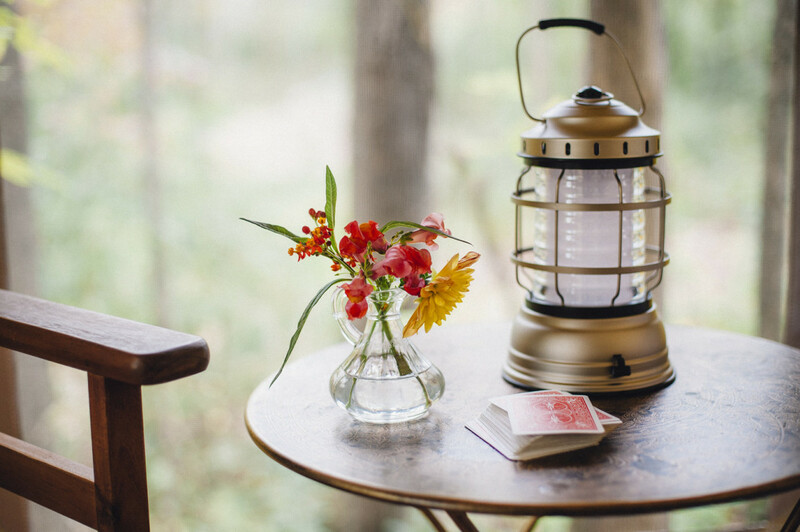 Explore Firelight's backyard of Upper Buttermilk Falls State Park.